There are over two hundred Bible verses about wisdom! By studying verses about wisdom, I believe that the Lord will help us make application to our lives. Here are twenty of these verses to study. For the Lord gives wisdom; from his mouth come knowledge and understanding; he stores up sound wisdom for the upright; he is a shield to those who walk in integrity (Proverbs 2:6-7 ESV). Happy is the man who finds wisdom, And the man who gains understanding (Proverbs 3:13 NKJV). For wisdom is better than rubies, And all the things one may desire cannot be compared with her. I, wisdom, dwell with prudence, And find out knowledge and discretion (Proverbs 8:11-12 NKJV). Fear of the Lord is the foundation of wisdom. Knowledge of the Holy One results in good judgment (Proverbs 9:10 NLT). But he who is of a perverse heart will be despised (Proverbs 12:8 NKJV). How much better to get wisdom than gold, and good judgment than silver (Proverbs 15:16 NLT)! Wise words are like deep waters; wisdom flows from the wise like a bubbling brook (Proverbs 18:4 NLT). The words of the wise are like cattle prods—painful but helpful. Their collected sayings are like a nail-studded stick with which a shepherd drives the sheep (Ecclesiastes 12:11 NLT). The mouth of the righteous utters wisdom, and his tongue speaks justice (Psalm 37:30 ESV). Daniel answered and said, Blessed be the name of God for ever and ever: for wisdom and might are his (Daniel 2:20). 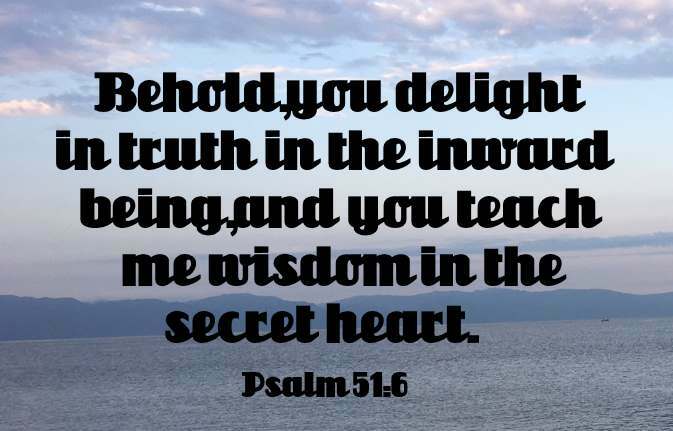 Behold, you delight in truth in the inward being, and you teach me wisdom in the secret heart (Psalm 51:6 ESV). Wisdom and money can get you almost anything, but only wisdom can save your life (Ecclesiastes 7:12 NLT). One wise person is stronger than ten leading citizens of a town (Ecclesiastes 7:19 NLT). And the child grew, and waxed strong in spirit, filled with wisdom: and the grace of God was upon him. ....... And Jesus increased in wisdom and stature, and in favour with God and man (Luke 2:40,52 ). The queen of Sheba will also stand up against this generation on judgment day and condemn it, for she came from a distant land to hear the wisdom of Solomon. Now someone greater than Solomon is here—but you refuse to listen (Matthew 12:42 NLT). For the wisdom of this world is foolishness with God. For it is written, “He catches the wise in their own craftiness” (1 Corinthians 3:19). To whom God would make known what is the riches of the glory of this mystery among the Gentiles; which is Christ in you, the hope of glory: Whom we preach, warning every man, and teaching every man in all wisdom; that we may present every man perfect in Christ Jesus (Colossians 1:27,28). I want them to be encouraged and knit together by strong ties of love. I want them to have complete confidence that they understand God’s mysterious plan, which is Christ himself. In him lie hidden all the treasures of wisdom and knowledge (Colossians 2:2,3). If you need wisdom, ask our generous God, and he will give it to you. He will not rebuke you for asking (James 1:5 NLT).